Rockstar Energy Husqvarna Factory Racing’s Billy Bolt has edged further ahead in the 2018 World Enduro Super Series rankings, with just the eighth and final round of the series remaining. Battling his way to a hard-fought 13th place finish at round seven of the series – the Gotland Grand National in Sweden – Bolt now heads to the series finale in The Netherlands with the World Enduro Super Series title firmly in his sights. Bolt’s teammates Graham Jarvis and Alfredo Gomez both successfully battled their way through the deluge of mud to place 27th and 32nd respectively. Over 3000 riders took to the start of this year’s Gotland Grand National, marking the 35th edition of the Swedish classic. 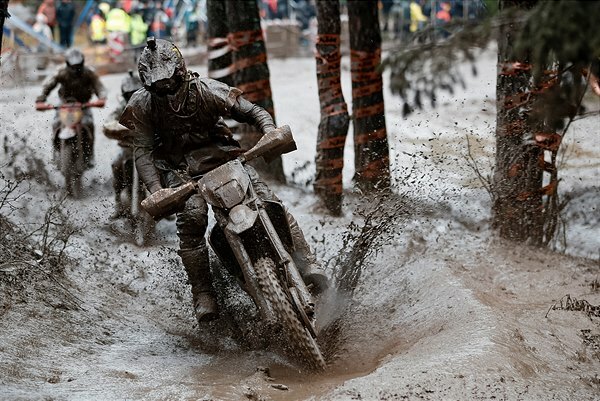 Heavy overnight rain continued into Saturday’s race day ensuring an extremely wet and muddy three-hour competition. Aiming to maintain his WESS championship advantage, Bolt was determined to put in a strong performance in the mud despite facing strong opposition from many of Sweden’s top riders and Gotland Grand National specialists. However, numerous issues and crashes on the opening lap resulted in Bolt being forced to pit for repairs to a damaged throttle tube. Slipping down the running order, the Brit pushed hard to battle his way back into contention. Steadily working his way forward with each passing lap, he eventually finished an impressive 13th to extend his lead in the championship chase. Behind Bolt, Graham Jarvis fared well. Knowing that the race would be long and tough, he completed a steady opening lap while adjusting to the conditions. Feeling more comfortable with the terrain as the race progressed, he improved in both speed and positions to finish 27th. Following a similar pattern, Gomez took lap one cautiously before building his pace as the conditions deteriorated. Picking up a few more positions during the closing stages, the Spaniard finished 32nd. Putting in an incredible performance, Husqvarna Sweden’s Albin Elowson was the overall winner of the race, claiming his debut victory at the Gotland Grand National. The World Enduro Super Series concludes in The Netherlands on November 10 for the Knock Out Beach Race. Download high-res images from Gotland Grand National here. This entry was posted in Enduro, Global News, Moto, Motorsports, Offroad by admin. Bookmark the permalink.